Score one for the waitress and manager who made that magic happen. That was an above-and-beyond move. I’d recommend this place just for that–but there’s more. This blog entry is dedicated to my daughter Stefanie–fashionista and now tour guide. It was her idea to have dinner outside on Las Vegas Blvd. That is so touristy. It was perfect! Maybe there’s a lesson here. Just because tourists do it doesn’t make it wrong. We set out with my cousins (it was after all their car) to Paris, midway down the Strip. From there we walked to the Planet Hollywood Casino. Planet Hollywood is a great example of rebranding. Previously known as the Aladdin and with a Middle Eastern theme, it had a mid range target. As with many of those immense hotels Aladdin had a mall. The Desert Passage was a long, circular affair. The few times I was in it was empty. Now Planet Hollywood has turned this closer to a ‘mall’ mall than the upscale shops at Caesars or Venetian. There were people roaming last night. 1) Jerry Springer is a headliner at Planet Hollywood! He emcees the America’s Got Talent stage show. 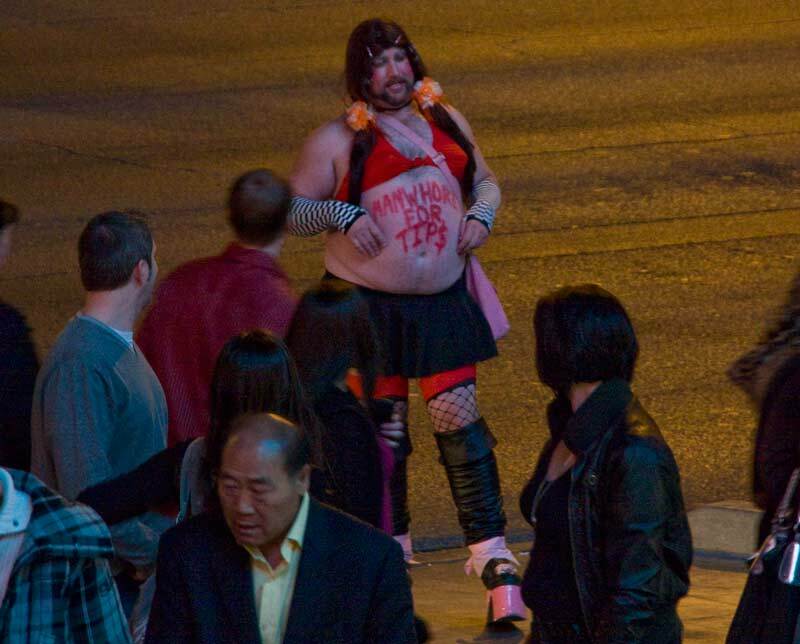 2) There’s a fat guy with a beard dressed over-the-top as a woman who stands on the street outside the PH. He takes photos with tourists working solely on tips. He might be the richest man in Vegas. He was crazily busy last night. Considering the weather, he was also very cold! 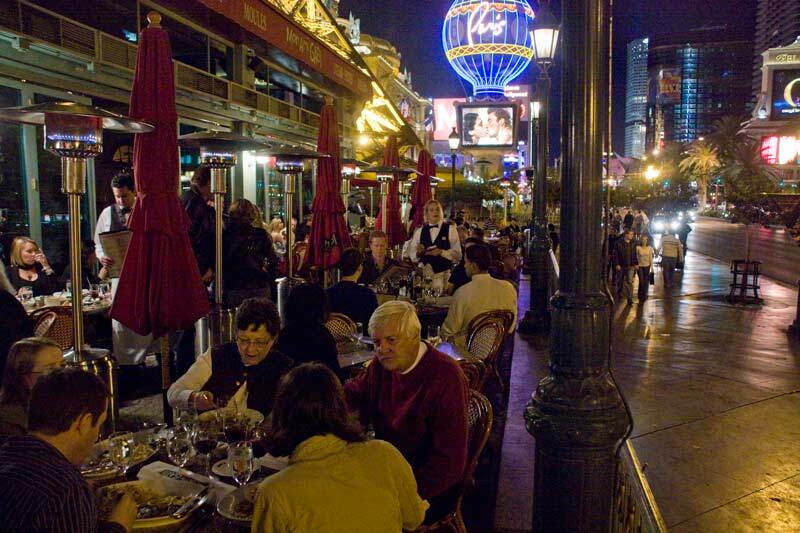 We headed back to Paris and into Mon Ami Gabi&#185, a French bistro attached to the Paris Hotel on Las Vegas Boulevard. We wanted to sit outside on the patio… and did at Table 138. We were right on Las Vegas Blvd with a great view for people watching and to see the fountain show across the street at the Bellagio. At one point my Cousin Michael asked if the propane heater could be moved closer to the table. Fire regs–it could not. But about five minutes later another heater was hoisted from the street and placed adjacent to our table. The menu had some French flare but it was obviously designed for American audiences. Before the meal we were brought hot baugets. Not warm–hot! There was a lot on the menu to choose from. Stef said her French onion soup was the best she’d ever had. I enjoyed my potato and leek soup. For dinner I had a brie cheeseburger. It was excellent on a tasty bun. The french fries were plentiful, though so thinly cut there was little substance. Helaine had a hanger steak. No complaints on the main course. This is Vegas and a tourist destination, but the prices seemed reasonable. We are non-drinkers all, so that kept the check in check. As it was this was an anniversary treat from our cousins. That was very sweet though totally unnecessary. We were too full for desert! In fact the past two night’s meals will probably affect what we eat for the rest of the trip. It’s easy to have too much–and we have. &#185We had pronounced Gabi, “Gabby.” The waitress pronounced it “Gah-bee” with the accent on the second syllable. I never did well in French. Sounds like a wonderful night all around….love the pictures…and kudos to Stefanie for pulling it off!